We eat a lot of corn, America. I am not talking corn on the cob rubbed with a little butter, salt and pepper, popcorn in huge tubs at the movie theater, or the occasional tortilla chips. Corn sneaks into our diet in very unexpected ways and in very surprising amounts. If you have read Michael Pollan’s Omnivore’s Dilemma, you know that, for instance, 93% of the hamburger meat that ends up at your table is derived from corn. Cows are fed a steady diet of grains (corn in particular) while on the farm, and they convert that corn into meat. It’s not only through the meat that we eat corn, most of the corn we consume comes in the form high fructose corn syrup. A sweetener that “‘hides” in most processed food, such as sodas, sauces and salad dressing, breads, breakfast cereals and bars, and processed snacks. OK, that is not straight corn (as in kernel corn straight off the cob) but it’s still corn. And is this bad? Well, the overwhelming majority of corn used for animal feed and corn byproducts (such as high fructose corn syrup) is field corn and it’s mostly genetically modified. Although the body of researches supporting the notion that ‘GMO is not good for us’ is pretty slim; GMO products are banned in 26 countries around the world (including all of the European Union). And that alone is for me enough of a reason to avoid it. Now you’re free to ask: Why this brief lecture on GMO corn dude? Because today we’re making polenta, and polenta is made of corn(meal) and water. Mkay? But, but, but, the corn used to make polenta is not ‘field corn’, it’s ‘sweet corn’ and it is NOT GMO. Talking about polenta, I have a favorite brand: Community Grains Floriani Red Flint Corn Polenta. A 100% organic, whole grain, whole milled and California grown cornmeal that it’s honestly U-mazing. I also like use instant polenta, such as Bob’s Red Mill Polenta Corn Grits. It literally cooks in 5 minutes which is so convenient. Maybe not as good as the other one, but still quite tasty. First off, this is super simple to make and so delicious. Kids seem to love it as well. My 8-year old nephew swears he doesn’t like polenta, but for some unknown reason he loves polenta pizza. I guess it has to do mostly with the shape, because tastewise it’s still polenta. Even though I like to call this pizza, you can’t really eat it with your hands. A fork will do the trick. IMO this polenta pizza is a brilliant way to enjoy something wholesome, gluten-free, heart-warming and delicious that comes together really quickly. One final paleo-related note before we proceed onto the recipe. Even though corn is gluten-free, it’s technically not paleo. It’s a grain, hence doesn’t make the paleo cut. It’s not strictly banned though. I’ve browsed through a bunch of paleo websites and it seems that a lot of paleo followers like to break the rule, here and there, and enjoy a juicy corn on the cob or some homemade tortilla chips or some polenta. My take on corn is the following: You like to have polenta or corn on the cob sometimes? Go for it. 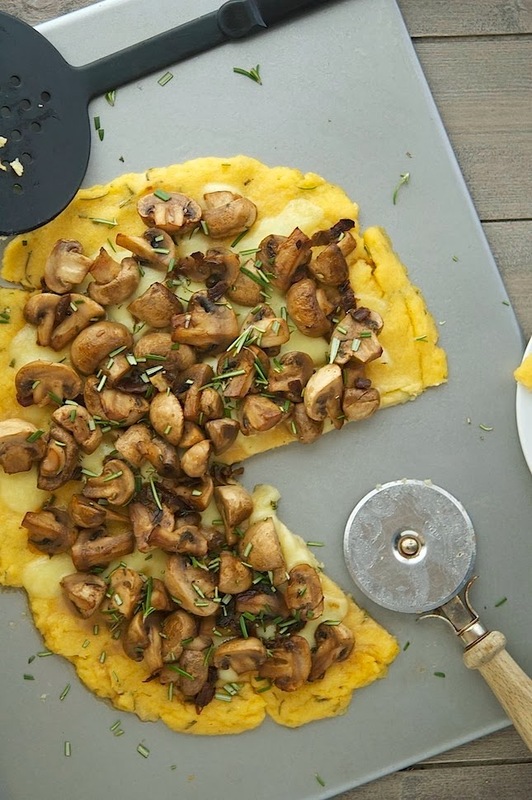 Mushroom Polenta Pizza Print this recipe! Heat the olive oil in the largest skillet you have over medium-high heat. Once hot, add the mushrooms and saute’ for 2 minutes without stirring (you want golden-brown patches on their surface). At the two-minute mark, stir and cook for further two minutes on the other side. Turn-off the heat, add garlic, thyme, season with a bit of salt and pepper, cover with a lid and set aside. Bring the vegetable stock to a boil in a medium saucepan. Slowly stir in the polenta, then reduce the heat to low and cook, stirring with a wooden spoon (it will splatter, so be careful!) The polenta is ready when it leaves the side of the pan but still runny. If you’re using instant polenta this should take about 5 minutes. With traditional polenta it should take about 30 to 40 minutes. If at any time the polenta starts to look dry, add more stock or water. Preheat oven to 425°F (210°C). When the polenta is ready, stir in Parmesan cheese, butter, rosemary and season with some salt and pepper. 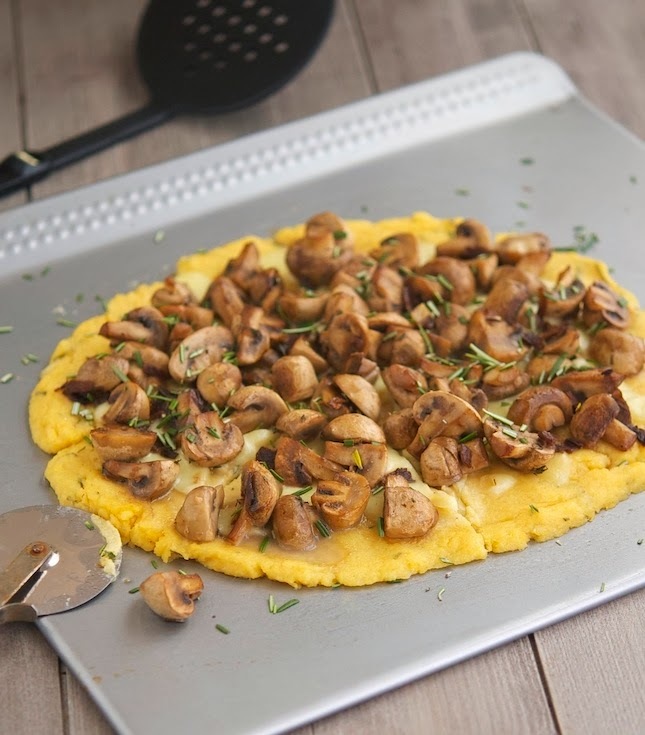 Using a spatula spread the polenta over a baking sheet lined with parchment paper lightly greased with olive oil (if you have non-stick baking sheet, skip the parchment paper). Try your best to give to the polenta a pizza shape. Sprinkle with mozzarella and bake in the oven until cheese is bubbly. This will take about 4 minutes. Remove from the oven, top with mushrooms, return to the oven and bake for 10 to 12 minutes until nice and golden. One serving yields 265 calories, 15 grams of fat, 19 grams of carbs and 16 grams of protein. Thanks for sharing Mike! I love mushrooms. Have to eat them in moderation, but love them nonetheless. And, this look delish!! 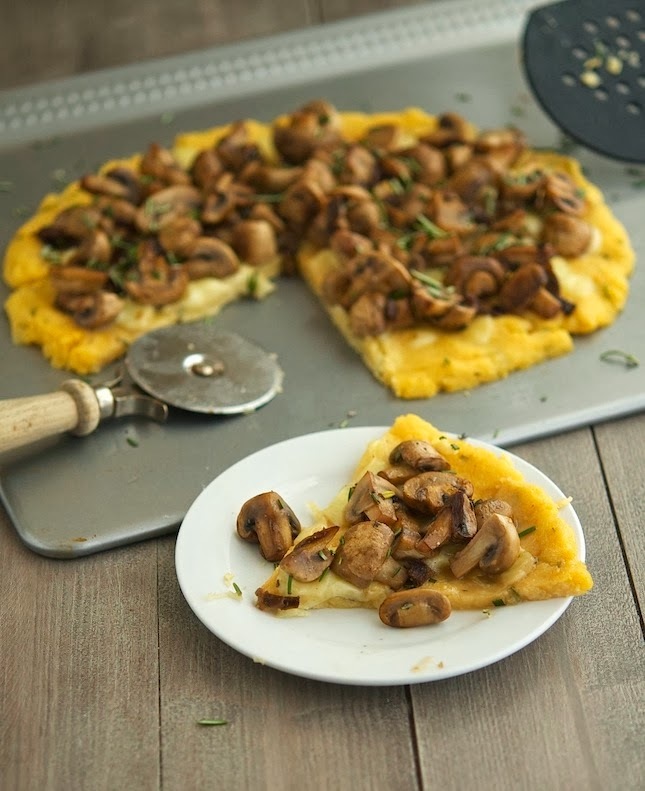 I'm a huge fan of mushrooms, and they were pretty fantastic on the polenta pizza! I love polenta! Thanks for sharing! I have yet to try polenta - till I saw this pizza of yours, it probably would not have made my "to try" list! It was more on the doughy side and you have to try polenta: it's soooo good! Thank you, thank you, thank you, Mike! There is a huge misconception and lack of knowledge about corn in today's world. You covered it well! I love the idea of polenta crust!!! Looks good! There's a lot of misconception going on about corn, I'm happy you found this useful Olena! this recipe was made for me - I have 3 packs of mushrooms staring at me, and a pack of Red Mill Polenta that I don't know what to do with. I never thought of making pizza ! great idea.. this is lunch tomorrow. That's awesome Archana, let me know how you like it! Oh, I miss polenta! 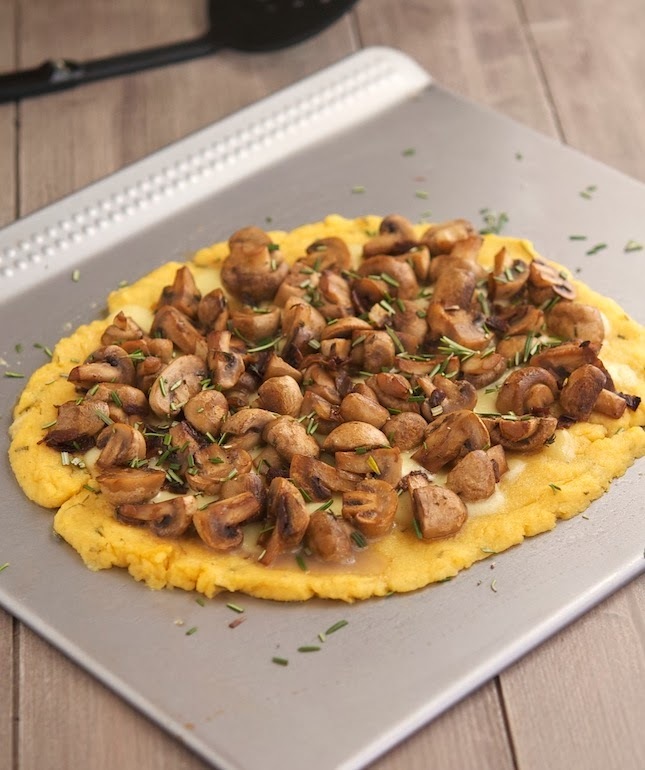 And this looks absolutely divine, although I would probably keep the polenta creamy, throw the mozzarella right in (or use extra sharp cheddar instead and perhaps add a little bit of blue cheese, too) and pile the mushrooms right on top. Oooooh, ooey gooey creamy goodness galore! Polenta pizza, now that's something new. Polenta is something I have cooked and wrapped all the time, time to make this. A great innovative dish. You have to try this Asha, it's the real deal! It actually says "Adapted from Plenty..." To me it sounds like a perfect mention!